Not all of the computer games I want my grandkids to play have a science or math theme. For example, the series of educational (and inexpensive) games called the Amazing Adventures series have a strong vocabulary builder built into the problem-solving and puzzle play. Kids increase their vocabulary without knowing that they are learning new words as they play through the game. 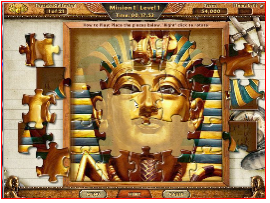 The first in the series is The Lost Tomb. 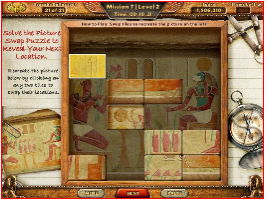 Searching the tombs of the ancient Egyptians never cease to be the context for an exciting game. At the opening screen, setup your profile by typing your name. All of your game progress is saved under your profile name. This keeps it separate from the saved progress of the other players. When you start the game, the opening screen displays a map of the Nile delta with your starting location highlighted. As you play, more locations are opened for exploration. You can also go back and replay any level with a new set of problems. After selecting a location, you will be shown a gorgeous picture brimming over with a myriad of objects skillfully blended in to the scene. 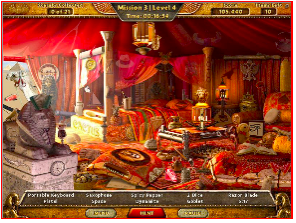 At the bottom of the screen appears a list of objects to find in the picture. The looked-for objects in the above scene are a portable keyboard, pistol, saxophone, 5:17, spicy pepper, spade, razor blade, goblet, 2 dice, and dynamite. or, a block puzzle as shown in this screen shot. Spintop games are available at Wal-Mart. Look in the $10 section of the PC games rack. I prefer to buy the games on Steam, an online game store. 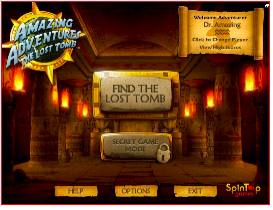 The Steam program itself is free and I encourage you to download Steam and then download the free demo of Amazing Adventures – The Lost Tomb. Any games that you purchase on Steam or demos that you download from Steam can be played on any PC connected to the Internet. Sorry, Macintosh users have to acquire games from other sources (email grandadscience@gmail.com for help). I created a Steam account for Joshua and Jordann (our two oldest grandkids) and purchased Amazing Adventures – The Lost Tomb for their account. They can now play the game anywhere they have access to a PC. Thanks for the review, these computer games are perfect for my 8 and 6 year old to work on together. They love the puzzle solving part. I will certainly check out this site and its games.